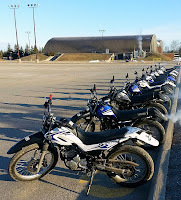 A couple of weekends ago I went to Conestoga College and took my motorcycle training course. Other than about an hour on a dirt bike a year ago I'd never ridden a motorbike, it's been a lifelong dream to do it, so I was pretty pumped. This was a challenging learning process for me, going from near zero to basic competence in a weekend. This weekend I'm at the Ontario Google Summit. I'm an advanced digital technology user, I'm attending this conference to look at ways to manage technology and ease adoption for beginners. This isn't a learning challenging situation for me, but I love the subject area (I teach it) and it's a life long hobby as well as a career. I'm finding myself comparing the two learning experiences. Bike course and Google Summit are both expensive (time and money: both on the weekend, motorbike: $18.33/hr, Summit: $17.83.hr), suggesting an intensive, focused learning opportunity for motivated students. Unmotivated students wouldn't spend the time and money to attend these things. With that as a foundation, I couldn't have had more different experiences. 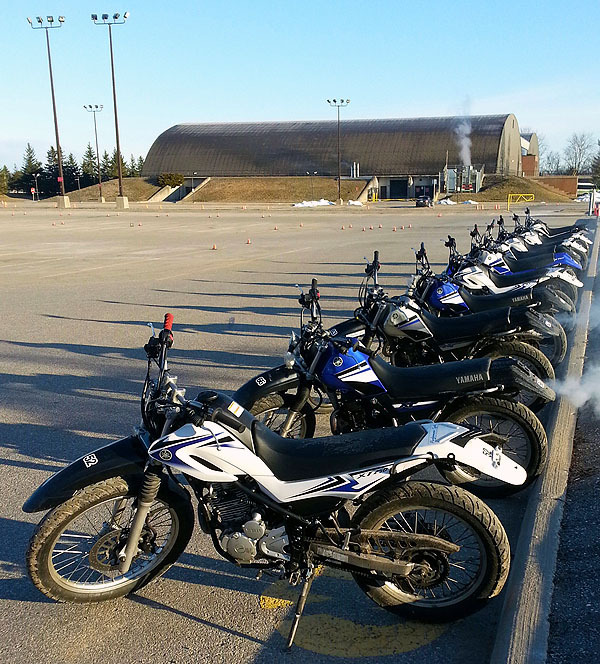 At the motorbike course there were six expert instructors for 26 students for a better than 5 to 1 student/teacher ratio. They moved logistical mountains to provide working technology for all students (over thirty bikes tuned, fueled and ready to use every day). Because a 1:1 student/technology ratio was guaranteed, the focus became small group and individual hands-on instruction. This was vital because the bike course had a theory and practical (road) test at the end. If you were unable to demonstrate what you knew by that time you just spend over four hundred bucks without getting the license or insurance discount. Attendance was absolutely mandatory, you got dropped for not showing (one guy got dropped Sunday morning after showing up nearly two hours late). You had to BYOE (equipment), but the most expensive technology (the bike) was provided, and it got dropped by a number of students. You also had to provide your own food and drink and there was time time given to consuming it (we ate during in-class sessions). At the end of the weekend you knew what you knew (or didn't) and had demonstrated qualitative improvement (or hadn't), resulting in the license and savings. On a more pedantic level, you were provided with the room you needed to learn. You had desk space in a large classroom for learning theory. You had acres of pavement outside for learning hand-on skills. You were hands on in a closely watched and personally assisted learning intensive situation all weekend. It was a credible, challenging and learning intensive process (it was also physically exhausting). My taking the course will probably save my life at some point, let alone save me money. I left that course having a very clear idea what I'd paid for and no question as to the value of it. 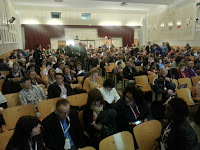 The Google conference is lecture driven (a necessity of the 100:1 student:teacher ratio). The keynotes have been excellent and the audience response very positive. I've greatly enjoyed the keynotes. It's fallen apart for me in the learning sessions though; I've been unable to attend the sessions I've wanted to because the venue (a high school) has classrooms designed for a thirty two students. These sessions often have upwards of fifty people jammed into them, sitting on the floor, standing around the edges, all breathing on each other (yes, I have issues with that). I don't have the space I need to be comfortable, let alone to learn. The provided internet is the best I've experienced at a tech-conference, so that's in place, but the physical space, other than the auditorium I've been in all weekend, isn't remotely up to the task of learning. As I consider the lecture based, knowledge (rather than experience) learning focus of the Summit, I'm left wondering why educators do this to each other, and how we hope to improve educational technology when we continue to treat it like an ephemeral idea rather than a demonstrable skill. What is it about professional development that has teachers punishing other teachers in order to learn? Ironically, we've spent time talking about the Third Teacher and how the learning environment plays such a vital role in learning. We then demonstrate how not to do it in vivid detail with overcrowded rooms and people sitting on floors in order to desperately hear a bit of knowledge out of the mouth of a sage on a stage who are part of a company that wants to radically decentralize and democratize knowledge for everyone. There has been a lot of opportunity for learning at this conference for me. The back channels and keynotes have been very engaging. Oddly, the learning sessions haven't been where learning has happened. Had this been the bike course, I would have spent that weekend sitting on the floor, jammed between other people, watching someone else riding a bike before I went and rode around on my own without any feed back; not the ideal way to learn how to do that, is it? note: this is six months later, right after the ECOO13 conference (not a summit?) not to mention EdcampHamilton. My feelings about GAFE have only intensified. GAFE is a money grab, designed to funnel teachers into a branding process with Google. After speaking to others at ECOO I'm more than ever convinced that it is a teacher's professional duty to not brand themselves and offer their students an unbiased access to any and all technology currently in use. Anything less is a limitation to students and irresponsible on the part of the technology educator. An art student who became a millwright and then a computer technician before going back to school for English & philosophy degrees. Now a computer technology teacher, digital creative and avid motorbike rider. Interested in digital technologies and emerging media. Neuro-atypical thinker on the edge of the ASD spectrum. My students win lots of competitions. Is The Digital World A Branded World? Timothy King www.atking.ca. Awesome Inc. theme. Powered by Blogger.